In recent years, the European Union has stepped up its commitment to bringing refugees to Europe through safe and legal channels—from the announcement of the EU Resettlement Scheme and the 2016 EU-Turkey agreement to calls by the President of the European Commission to create an additional 50,000 resettlement spots. But while a handful of Member States have well-established refugee resettlement programs, meeting these goals will require others to quickly build capacity and actively participate. This pressure has led many government representatives to turn to their peers (in Europe and beyond) for knowledge, advice, and operational support. 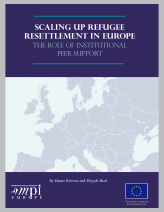 This report draws on interviews with officials across Europe, as well as in Canada and the United States, to explore the peer-support initiatives that have emerged amid efforts to scale up refugee resettlement in Europe. It maps the wide array of activities that incorporate elements of peer support—from study visits and general training to ongoing mentoring and information exchanges—with a close eye to ways program designers can better align the activities they develop with their goals for a program. Critically, the authors note a need to rethink how peer-support initiatives select and match up participants. While many initiatives currently pair up participants based on a general sense of which countries have more and less experience with resettlement, a more nuanced look at other influential factors (such as social welfare systems, governance structures, and the resources available for resettlement) can help boost the transferability of knowledge and best practices. With much riding on the success of national resettlement programs and the peer-support initiatives that inform them, this analysis also points to a pressing need to evaluate peer-support models and ground future initiatives in solid evidence of what works and in what contexts. II. Why Engage in Peer Support? VI. Conclusions: What Role for Peer Support in Resettlement Going Forward?